Ordering flowers has never been so easy than at FlowerFresh. With an array of color coordinated flower bouquets, in an array of unique and refreshing designs and in varying price points, FlowerFresh aims to make your buying experience easy and enjoyable. We want you to have fun choosing the design, color and type of flower for your very special bouquet. We make every bouquet look special, whether it is a yellow flower bouquet or a pink flower arrangement, we put 110% into every order. Flower Color Meanings: Flowers may not have a soul, but they definitely have a way touching our souls. Hear the word 'flowers' and a spectacular world of colors materializes. Each flower color signifies a deeper meaning and expresses a feeling. Just wonder how easy it will be to convey our thoughts if we know what flower colors mean and what these flower color meanings represent. So, just enter the world of flowers and let the flower colors guide you! Red flowers symbolize love & romance. A dozen long-stemmed red roses have been the classic romantic gift from ages. Think pink and you think of grace, gentility, and happiness. 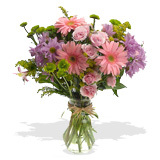 Pink flowers are for that special sweet and romantic part of your life. Yellow flowers evoke joy and are a symbol of friendship, white flowers convey a sense of peace, innocence, purity and perfection. Blue flowers are very rare and have a calming effect on people. Blue Flowers are a symbol of valued friendship. Energetic and natural, green flowers, reflect self-respect and order. Green flowers are comforting and represent good health and youth.